Essex seamer Jamie Porter has signed a new three-year contract with the club. The 22-year-old, who has been an ever-present in Essex's County Championship side this year, will stay at Chelmsford until the end of the 2018 season. He has taken 52 wickets at an average of 25.57 in his four-day career and made his one-day debut this season, taking five wickets. "He has a brilliant attitude and is always willing to improve," said Essex committee chairman Ronnie Irani. 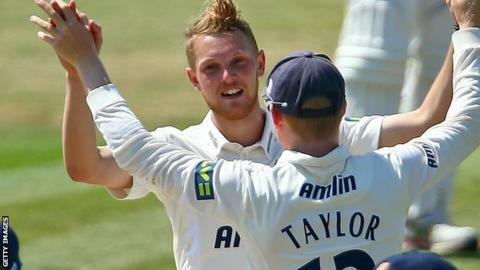 "Jamie has shown this season what a talent he is and now has the opportunity to continue his development for the next three years and become a key member of the Essex squad," added the club's former all-rounder Irani, 43, who played three Test matches and 31 one-day internationals for England. Now his immediate future is sorted, Porter is looking forward to continuing his progress. "This will give me the chance to continue what I've been doing this season and keep developing as a player," he said. "I have learnt a lot over the past season and have enjoyed taking more of a responsibility with the ball in the County Championship and One-Day Cup." What has gone wrong with the Dutch? Read more on Euro 2016: What has gone wrong with Netherlands?